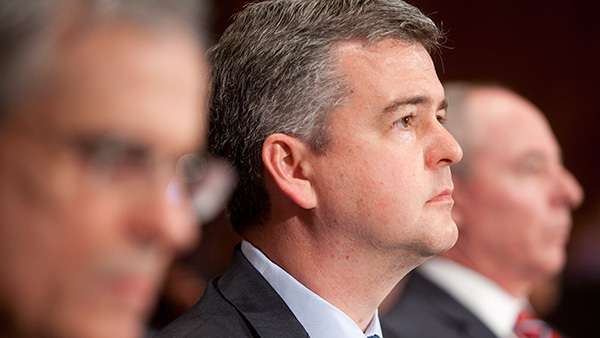 Daniel Gallagher, one of the Securities and Exchange Commission's two Republican commissioners, has been very vocal as of late regarding his belief that the agency doesn't need to write a rule to put brokers under a fiduciary mandate. Daniel Gallagher, one of the Securities and Exchange Commission’s two Republican commissioners, has been very vocal as of late regarding his belief that the agency doesn’t need to write a rule to put brokers under a fiduciary mandate. In mid-March, Gallagher said that he’s “not sure a majority of the commission believes we need to use” the authority under Section 913 of the Dodd-Frank Act to write a uniform fiduciary rule, which SEC Chairwoman Mary Jo White has said the agency will determine this year. Then in mid-May, he told IA that the debate over whether the SEC should write a fiduciary rule is “not fair right now” because of a mismatch in advisor/broker exam data—suggesting that a self-regulatory organization needs to be appointed to help the agency create a “real exam program” for advisors. In a speech in mid-May at the 46th annual Rocky Mountain Securities Conference in Denver, Gallagher said that the SEC’s failure to catch investment advisor wrongdoers as quickly as those in the broker-dealer realm is due to the lack of a self-regulatory organization for advisors as well as “unfunded mandates” imposed upon the SEC by the Dodd-Frank Act. Gallagher noted in the speech the “eye-opening” results of recent statistics that he requested from the SEC’s Office of Compliance Inspections and Examinations, which were based on disclosure information submitted by broker-dealer registered reps on FINRA’s BrokerCheck system. The SEC, he said, has the Financial Industry Regulatory Authority to help it oversee 4,300 broker-dealers, whereas the commission has no help from an SRO like FINRA to help it examine the 11,100 advisors. “Simply put, it is impossible to separate the fact that we find many more broker-dealer violations than investment advisor violations from the fact that thanks to the assistance of the SROs, we examine a greater proportion of broker-dealers than investment advisors,” Gallagher said. Despite recent comments by FINRA CEO Richard Ketchum that the self-regulator’s efforts to become the SRO for advisors has, for now, died on the vine, Gallagher hinted at defining a “third-party” examiner as an SRO. Rep. Spencer Bachus, R-Ala., the former chairman of the House Financial Services Committee who now serves as chairman emeritus, told SEC Chairwoman Mary Jo White in late April that despite his failed attempts to get a bill passed supporting a self-regulatory organization to help boost advisor exams, she should continue exploring options to increase advisor exams. Rep. Maxine Waters, D-Calif., told White the same day that she was “pushing very hard” to secure support for her user fees bill, the Investment Adviser Examination Improvement Act of 2013, H.R. 1627, which would allow the SEC to collect user fees to fund advisor exams.